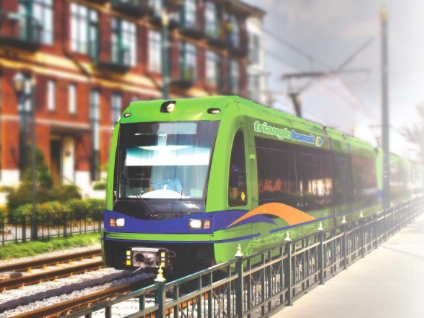 Since 1995, leaders in the Raleigh-Durham region of North Carolina have dreamed about connecting its major centers via light rail. The results of Tuesday night’s election might finally make it happen. The light rail plan calls for links between the three downtowns of Raleigh, Durham, and Chapel Hill. Getting three separate areas, and three separate legislative bodies, to commit to light rail has been somewhat tricky, but there’s also been major progress. Voters in Durham and Chapel Hill passed half-cent sales tax increases to support light rail and increase bus service in 2011 and 2012. But for the last few years there’s been little to no progress in Raleigh — the third leg of the “Research Triangle” and the largest population center in the region. Wake County commissioners have refused to discuss regional transit plans, much less introduce a ballot measure that would put the issue before voters. Tuesday’s election results, however, sent a clear signal that Raleigh is ready to get moving on transit. Democratic candidates, who campaigned on moving ahead with rail, swept all four available seats on the Wake County Commission, and the party now controls all seven votes. One winner Tuesday night, Sig Hutchinson, was formerly a board member and chair of the regional transit agency, Triangle Transit, which is leading the light rail plans. Transit expansion was a top-tier issue for the four Democratic candidates. “For three years, GOP voted to prevent even a discussion of transportation options,” the team wrote on its campaign website, which asserted that the growing region would end up “like Atlanta” without decisive action to expand transportation options. “We built a campaign of making smart investments in our future, particularly education and public transportation, and the voters told us tonight that they’re ready to move forward,” winning candidate Matt Calabria told the Raleigh News and Observer.